Did the 'Star Wars: Rise of Skywalker' teaser hint at the return of Rey's parents? – AiPT! Will Star Wars: Episode IX revisit Rey’s origins — specifically her parentage? Warning: Possible spoilers for Star Wars: Episode IX. If you haven’t seen the Star Wars: Rise of Skywalker teaser trailer by now, you can crawl out of whatever asteroid field you’ve been living in — director J.J. Abrams looks ready to restore balance to the fanbase (after the very divisive The Last Jedi) in the final installment of the Star Wars sequel trilogy. The usually secretive Abrams dropped some proton-bomb sized revelations in the teaser, including the laugh heard ’round the galaxy (Emperor Palpatine’s infamous cackle can be heard in the teaser’s final seconds) and the Episode IX title itself galvanizing plenty of mystery as to who or what the name Skywalker refers to exactly. But did the teaser also presage another intriguing plot element from Rise of Skywalker? Namely: Rey’s parents? Are we simply looking at two similarly designed ships? Or are the similarities so striking there’s no way we’re not being shown the exact same ship that dumped Rey off Jakku? The debate seems split down the middle so far. Reddit user Plapytus isn’t so sure. 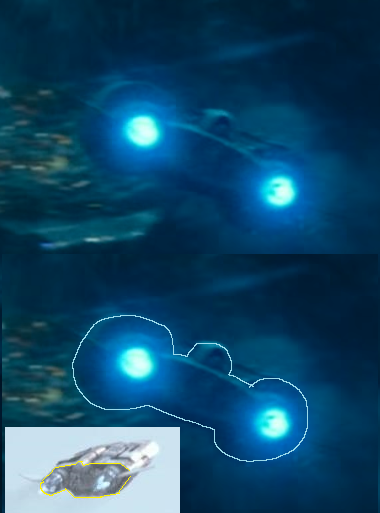 “Here, I took what I think is the single clearest frame from the ship in the teaser and compared it with the one from The Force Awakens. The main thing you can clearly see is how the teaser one has those massive round engine ‘nacelles’ that are part of the fuselage while the TFA has nothing like that. Only the engine nozzles are round, the rest of the the ship is flat. Does the Rise of Skywalker teaser hint towards refuting the notion of Rey’s undistinguished parentage established in The Last Jedi? That is, will Episode IX reveal that Rey’s parents weren’t “filthy junk traders who sold her for drinking money” after all? And if not, who are they really?